Leroy J. Hoops, age 85, of Bryan, Ohio, died at 6:38 A.M. on Wednesday, December 5, in his home after an extended illness. Leroy had worked in construction for several years, then worked for the City of Bryan in the Street and Parks & Recreation Departments. He did many of the masonry projects for the city including Central Park and the arches in Garver Park. He was a US Army veteran serving from 1954-1956. Leroy was a member of Trinity Lutheran Church and Bryan American Legion Post #284. He enjoyed bowling for many years and woodworking making wooden toys and bird houses. Leroy J. Hoops was born December 4, 1933 near Deshler, Ohio, the son of Arthur and Juanita (Nichols) Hoops. He married Ila J. Hulbert on October 6, 1957 in Deshler and she survives. Leroy is also survived by his daughter, Deborah (Aaron) Sorg, of Fort Wayne; son, Kevin Hoops, of LaGrange; brother, Ronald (Mary Kay) Hoops, of Malinta and sisters, Mary Lou (Louis) Streicher, of Holgate and Barbara Kruse, of Defiance. He was preceded in death by his parents, a son, Tracy Hoops and brothers, Kenneth, Wayne and Lester Hoops. 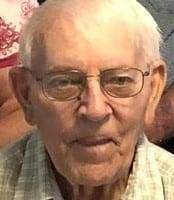 Visitation for Leroy will be held on Friday, December 7, 2018 from 4:00-8:00 P.M. at Krill Funeral Home, 860 West Mulberry Street, Bryan, Ohio. Visitation will be continued on Saturday, December 8, 2018 starting at 10:00 A.M. followed by the funeral service at 11:00 A.M. at Trinity Lutheran Church, Bryan with Pastor Mary Beth Smith-Gunn officiating. Burial will follow at Trinity Lutheran Cemetery with military rites accorded by Bryan American Legion Post #284 and the US Army Honor Detail. The family requests memorial donations to the Bryan Parks & Recreation Department or Trinity Lutheran Church. Condolences may sent to and the online register signed at www.krillfuneralservice.com. Be the first to comment on "Leroy Hoops (1933-2018)"